The first electoral campaign was launched in 1967. This was the first national election in which the system of Universal Adult Suffrage was to be applied, all due to the hard struggle of the SPUP to obtain it. It was also the first time in the history of Seychelles that a political party had come to address the people with positive and constructive suggestions towards the march for freedom. 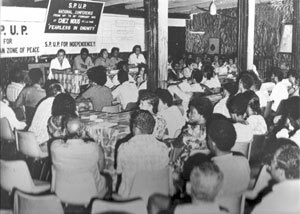 During the electoral campaigns of 1967, 1970 and 1974, SPUP officials held meetings and marches not only in Victoria but also in various locations on Mahe, Praslin and La Digue. Such meetings, were the main means for the mobilisation and education of the masses. Despite electoral losses of the SPUP under illicit circumstances, such as bribery and corruption, from these elections, the popularity of the Party and especially of its leader was undeniable. It was here that the secret of the Party’s power lay. One of the biggest popular manifestations in SPUP’s struggle for independence was the Freedom March of the 11th March 1973. Thousands of Seychellois from all corners of Mahe, Praslin and La Digue, young and old, men, women and children, walked a distance of 8 miles from Anse aux Pins to Victoria, demonstrating their adhesion to SPUP’s watch-word: INDEPENDENCE NOW! There were Constitutional Conferences held in London since 1970, but nothing really concrete emerged concerning independence for Seychelles. It was only in 1975 and 1976 that the pre-independence Constitutional Conference were held. This conference lasted over a week and ended in a deadlock over several issues, the most important being the question of whether there should be fresh elections on a more equitable and democratic basis before independence. 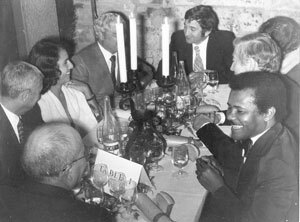 Finally, it was decided that another Constitutional Conference would be held in January 1976, but that the date for independence should, in any case, not be later than June 1976. The renewed Constitutional Conference in January 1976 finally set the seal on Independence Constitution for Seychelles, after opting for Republican Status on Independence. The SPUP thus demonstrated its remarkable capacity to use constitutional means of achieving its aims, starting with the conquest of Universal Manhood Suffrage, continuing with the participation in the Legislative Council, the struggle for successive constitutional changes, and ending with the accession to Independence. The fundamental aims and objectives of the SPUP as stated in the Party’s constitution – Independence, Unity and Progress – provided the main guideline for the strategy and tactics agreed by the first National Congress and so it was that this first Congress, after lengthy discussions and heated arguments, decided to accept the idea of a coalition government, to lead the country to political independence. June 1975 saw the formation of the coalition government, with make-shift arrangements to increase the Legislature and Cabinet. Five members of both parties were nominated as members of the National Assembly. Four SPUP and eight SDP members of the Legislature formed the Cabinet in the Coalition Government. Seychelles entered self-government in September of the same year with J. Mancham as Prime-Minister and F. A. Rene as Minister of Works and Land Development.